Neurofibromatosis type 1 (NF1) is a dominantly inherited tumor predisposition syndrome that targets the peripheral nervous system. It is caused by mutations of the NF1 gene which serve as a negative regulator of the cellular Ras/MAPK (mitogen-activated protein kinases) signaling pathway. Owing to the complexity in some parts of clinical diagnoses and the need for better understanding of its molecular relationships, a genetic characterization of this disorder will be helpful in the clinical setting. In this study, we present a customized targeted gene panel of NF1/KRAS/BRAF/p53 and SPRED1 genes combined with Multiple Ligation-Dependent Probe Amplification analysis for the NF1 mutation screening in a cohort of patients clinically suspected as NF1. In this study, we identified 73 NF1 mutations and two BRAF novel variants from 100 NF1 patients who were suspected as having NF1. These genetic alterations are heterogeneous and distribute in a complicated way without clustering in either cysteine–serine-rich domain or within the GAP-related domain. 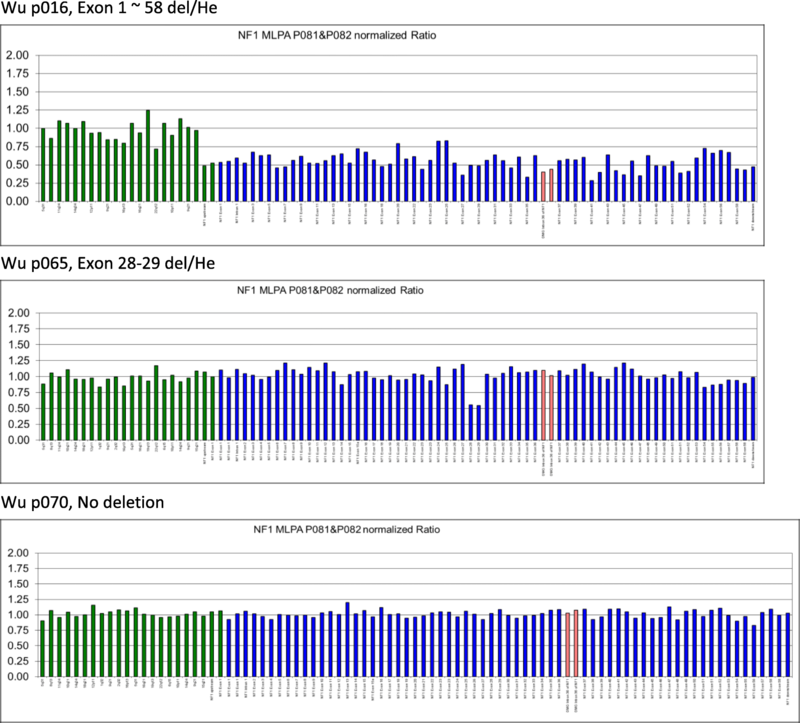 We also detected fifteen multi-exon deletions within the NF1 gene by MLPA Analysis. Our results suggested that a genetic screening using a NGS panel with high coverage of Ras–signaling components combined with Multiple Ligation-Dependent Probe Amplification analysis will enable differential diagnosis of patients with overlapping clinical features. Neurofibromatosis type 1 (MIM# 162200) is a very common genetic disorder affecting approximately 1 in 3000–4000 individuals worldwide with the penetrance of the mutant gene being close to 100% by 5 years of age [1–4]. Clinically, it is presented with the occurrence of Café-au-lait macules, Lisch nodules, axillary freckling and multiple neurofibromas. Phenotypically, Neurofibromatosis type 1 (NF1) patients have a very heterogeneous condition. Discrete dermal neurofibromas occur in almost all adults with NF1, and the number usually increases with age. If whole-body magnetic resonance imaging (MRI) is used, plexiform neurofibromas are detectable in at least half of NF1 patients. Other complications include learning disabilities, mental retardation, optic gliomas, certain bone abnormalities, CNS tumors, and an increased risk for certain malignancies [5, 6]. NF1 is caused by mutations of the NF1 gene which maps to chromosome 17q11.2. Many evidences have suggested NF1 as a tumor suppressor gene as inactivation of both NF1 alleles would reduce the control of cell proliferation and lead to tumorigenesis [7, 8]. The function of NF1 gene product, neurofibromin, is to stimulate the GTPase activity of the RAS protein and serve as a negative regulator of the cellular Ras/MAPK (mitogen-activated protein kinases) signaling pathway [7, 9–11]. Up to date, more than 1000 pathogenic allelic variants have been identified in the NF1 gene [The Human Gene Mutation Database (HGMD, Institute of Medical Genetics, Cardiff, http://www.hgmd.org/; Leiden Open Variation Database, LOVD: www.lovd.nl/NF1]. Most NF1 mutations are single-base substitutions, insertions, or deletions. Other mutations are single- or multi-exon deletions or duplications and microdeletions encompassing NF1 and its neighboring genes [12–22]. NF1 is a member of RAS-related disorders, which usually show similar clinical features in cutaneous signs, cardiac defects, developmental disabilities and neurocognitive impairment [23–25]. Therefore, molecular diagnosis in NF1 should be of great value to confirm the diagnosis, particularly in the early childhood. However, the procedures for molecular diagnosis of NF1 are usually expensive, time-consuming, and labor-intensive [15–21, 26–28]. The development of next-generation sequencing (NGS) technologies which allows for rapid identification of disease-causing mutations and high-risk alleles has recently been introduced into NF1 diagnosis [29–34]. Owing to the complexity with some aspects of clinical diagnoses and the need for a better understanding of its molecular relationships, an extended genetic characterization of this disorder will be helpful in a clinical setting. One hundred NF1 patients suspected as having NF1 by a clinical evaluation were recruited for this study. From each patient, 10 ml of whole blood samples were collected in EDTA-anticoagulant tube through the Linko Medical Center of the Chang Gung Memorial Hospital. Fifteen patients had a known family history of NF1. Ethical approval for this study was obtained by the institutional review board (102-0226A3) at Chang Gung Memorial Hospital. All participants provided written informed consent. Genomic DNA of each patient was then prepared using the PUREGENE DNA purification kit from GENTRA using standard protein precipitation procedures. The quality of the DNA was estimated using the Nano-Drop spectrophotometer (Thermo Fisher Scientific, Waltham, MA, USA). A panel of five NF1-related genes including NF1 (NM_000267, 17q11.2), SPRED1 (NM_152594, 15q14), KRAS (NM_004985, 12p12.1), BRAF (NM_004333, 7q34), and p53 (NM_000546, 17p13.1) was initially created designed to capture, amplify, and sequence specific regions (including exons and splice junctions) of the genome for human cancer screening. The total length was 32.3 kb encompassing 296 amplicons, and the coverage was 507×. Adapter sequences were clonally amplified by emulsion PCR on the high-density array of micro-machined wells. In this study, we took the advantage of this gene panel for the germline mutation analysis of NF1 using the Ion Personal Genome Machine® (PGM™) Sequencer (Life technology). A total of 100 indexed rapid prepared Ion AmpliSeq DNA libraries, starting from 100 ng of gDNA per sample, were prepared according to the manufacturer’s instructions. Template preparation and emulsion PCR and Ion Sphere Particles (ISP) enrichment were performed according to the manufacturer’s instructions. Following the purification and size selection using AMPure beads (Beckman Coulter, Brea, CA, USA), the size distribution of the DNA fragments was analyzed on the Agilent Bioanalyzer using High-Sensitivity DNA chip (Agilent Technologies Inc., Santa Clara, CA) and the quality checking of ion sphere particles for the prepared library was performed using Qubit 2.0 Fluorometer (Life Technologies). Enriched ISPs were prepared for sequencing using the Ion PGM 200 Sequencing Kit v2.0 and were loaded on an Ion 316 chip v2 or Ion 318 chip v2. We used IT platform-specific pipeline software Torrent Suite, version 4.2, with the plug-in “variant caller” program (Life Technologies) to perform reference genome alignment, base calling, and filtering of poor signal reads. The Integrative Genome Viewer (IGV) (http://software.broadinstitute.org/software/igv/) was used for visualizing the status of each read alignment. The selected variants were classified as deleterious mutation by mutation type if they were identified as nonsynonymous, frameshift, or stopgain at the exonic region. ACMG Standards and Guidelines for the interpretation of sequence variants were followed in this study . In an appropriate reference population, the pathogenic variant should have a frequency of much less than 1%. We removed all the common variants (Minor Allele Frequency, MAF > 1%) reported in the following public databases: 1000 Genomes Project (http://www.1000genomes.org/), dbSNP database and ClinVar database (https://www.ncbi.nlm.nih.gov/snp/; https://www.ncbi.nlm.nih.gov/clinvar/). Variants with amino acid changes were further examined for whether the changes were potentially damaging alterations using Sorting Tolerant From Intolerant (SIFT) and Polymorphism Phenotyping v2 (PolyPhen2) softwares, which can predict the possible impact of an amino acid substitution on the structure and function of a protein. The nomenclature of novel variants followed the rules of the Human Genome Variation Society (http://www.hgvs.org/mutnomen/). The genetic variants in the Human Gene Mutation Database (HGMD, Institute of Medical Genetics, Cardiff, http://www.hgmd.org/) and Leiden Open Variation Database (LOVD: www.lovd.nl/NF1) were also considered as references. We performed Sanger validation for all putatively pathogenic SNVs and indels variants on each detected patient (and their family members, if available) by PCR amplification and sequenced with Applied Biosystems 3730 Genetic Analyzer. PCR amplification was performed under standard conditions with 30 PCR cycles and 55°–60 °C annealing. PCR products were sequenced using the Big Dye Terminator cycle sequencing kit (Life Technologies) according to the manufacturer’s cycling conditions and analyzed on an Applied Biosystems 3730xl Automated Sequencer Genetic Analyzer (Life Technologies). Sequence alignments and analysis were further performed using the Autoassembler computer program (Life Technologies). We used SALSA P081/P082 NF1 MLPA kit (MRC Holland, Amsterdam, The Netherlands) to confirm and identify single and multiple exon deletions/duplications according to the manufacturer’s protocol. Each samples containing 100 ng of genomic DNA was used for overnight hybridization with the probemixes. After ligation and amplification were performed with FAM-labeled primers, the PCR products were analyzed on a Genetic Analyzer 3730 capillary electrophoresis system and interpreted using Genotyper version 2.0 (Applied Biosystems, CA, USA). In this study, we used the Coffalyser program (version 3.5) for peak area normalization and gene dosage calculation. A total of 100 individuals from 95 families who were clinically suspected as carrying NF1 were referred for this genetic testing. A brief summary of the clinical data collected for each patient is given in Table 1. Fifteen patients (15%) had a family history of NF1 in this cohort. Café-au-lait spots and Lisch nodules in the iris were observed in 93 and 19 patients, respectively. Cutaneous neurofibromas, plexiform neurofibromas and malignant peripheral nerve sheath tumors were identified in 32, 13, and 2, patients, respectively. Five patients had optic gliomas and two patients had brain tumors. Among these individuals, we have identified seventy-three NF1 mutations (Table 2) and two BRAF novel variants from a targeted NGS gene panel of NF1/KRAS/BRAF/p53 and SPRED1 analyses. SPRED1 genetic mutations were not detected in this study. Variants with amino acid changes were further examined to check if the changes were potentially damaging alterations using Sorting Intolerant from Tolerant (SIFT) algorithm and Polymorphism Phenotyping v2 (PolyPhen2) software, which can predict the possible impact of an amino acid substitution on the structure and function of a protein. Genetic alterations in the NF1 gene were detected as frameshift, nonsense, splice, missense mutations, and frame deletions or duplications from the first NGS panel screening (Fig. 1). These variants distributed along the NF1 gene without any clustering hotspot domain. Intragenic NF1 point mutations were found in 46 patients, 28 nonsense and 18 missense mutations. Small insertions and/or deletions were identified in 24 patients and most of them with frameshift consequences. Splice alterations were detected only in three patients. 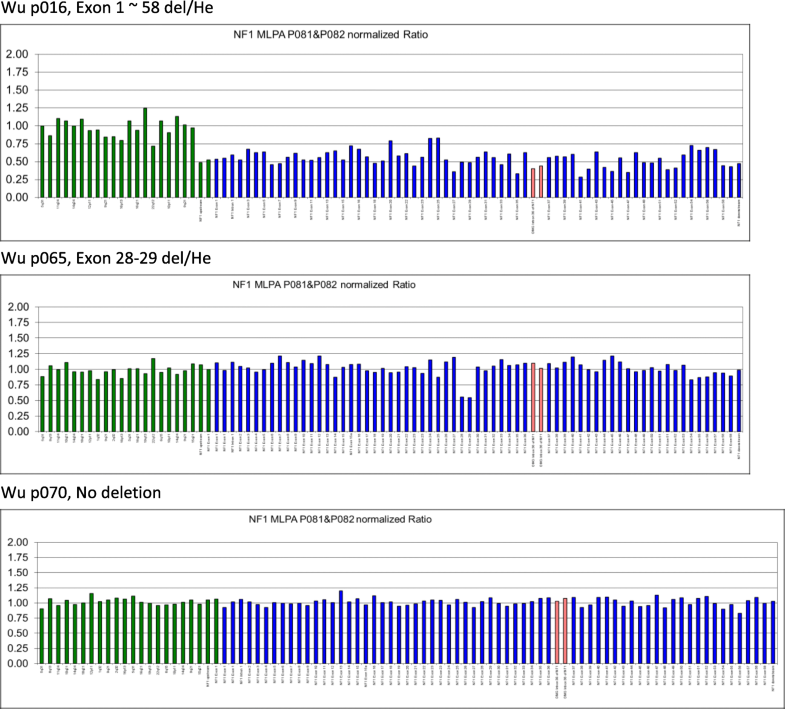 Four patients (Wu p003, Wu p018, Wu p019, and Wu p077) possessed more than one NF1 variant. Two patients with BRAF variants (c.74C > T in Exon1: p.Pro25Leu; c.G316A in Exon 3: p.Gly106Arg) were identified from this NGS screening. Both these patients also carried NF1 mutations (Fig. 2). On comparing with the Human Gene Mutation Database (HGMD, Institute of Medical Genetics, Cardiff, http://www.hgmd.org/), and Leiden Open Variation Database (LOVD: www.lovd.nl/NF1), we found that 48 variants of NF1 gene and two of BRAF gene are supposed to be novel (presented in bold in Table 2 and Table 3). All these novel mutations in this study were tested in 100 normal alleles. For patients who showed no detected mutations by our NGS panel screening, we then analyzed possible exons deletion/duplication within the NF1 gene using multiplex ligation-dependent probe amplification (MLPA) approach. Whole NF1 gene deletions were found in three patients and fifteen multi-exon deletions within the NF1 gene were obtained in this cohort of NF1 patients. Most of these exon deletions were only seen once in this study (Fig. 3, Table 3). Patient (Wu p001) was diagnosed as NF1 at the age of seven years by the presence of left craniofacial plexiform neurofibromas, infiltrative at the left temporal scalp, nodular subcutaneous tissue of the cheek, masticator space and probably the parotid space. He had multiple café-au-lait spots but no Lisch nodules. His brain magnetic resonance image (MRI) showed multiple unknown bright objects at pons, bilateral cerebellar hemisphere, globus pallidus and right thalamus. His left temporal and zygomatic bone showed progressive enlargement. His father (Wu p039) was the first patient with NF1 in this family and was diagnosed as having NF1 because of the presence of Lisch nodules, skeletal dysplasia, hundreds of café-au-lait spots and cutaneous nodular neurofibromas all over the body. This father and son are both intellectually normal. They both share the same genetic alterations on NF1 (c.492_495 del AACT/p.Val166fs) and BRAF (c.74C > T/p.Pro25Leu) gene (Fig.2). Another patient (Wu p083) was diagnosed as having NF1 at age of five years. He had multiple café-au-lait spots and Lisch nodules with soft tissue mass over the right back. He also had unspecified heart anomaly and T-spine scoliosis. His brain MRI showed white matter hyperintensity suggesting spongiform change at the left globus pallidus, dorsal pons, and bilateral cerebellar hemisphere (dentate nuclei) but no definite evidence of optic gliomas. He was detected as having NF1 (c.2953dupC/p.Gly984fs) and BRAF (c.316 G > A/p.Gly106Arg) genetic variants in the first NGS screening (Fig. 2, Table 2). These three patients presented no data for their definite atrial septal defect, ventricular septal defect and patent ductus arteriosus. In addition, none of these patients show the typical features of NF1–Noonan syndrome, Noonan syndrome or CFC syndrome. We here assessed a DNA-based approach combining targeted gene panel screening with MLPA analysis in a cohort of clinically suspected NF1 patients. On targeted gene panel screening, we identified 73 NF1 mutations and two BRAF variants (c.74C > T: p.Pro25Leu; c.316 G > A: p.Gly106Arg) in a total of 100 NF1 patients from 95 families diagnosed as having NF1 on the basis of the clinical criteria. 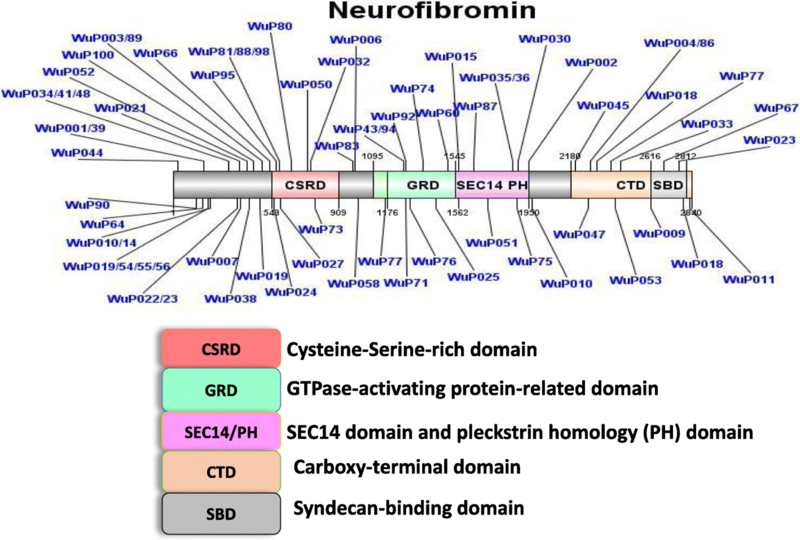 These mutations are heterogeneous and distribute without clustering in either cysteine–serine-rich domain or within the GAP-related domain. For patients in whom mutations were not detected by our NGS panel screening, we detected fifteen multi-exon deletions within the NF1 gene by Multiplex Ligation-Dependent Probe Amplification (MLPA) analysis (~ 15% of detected NF1 alterations). A multi-step mutation detection protocol has been used for over 95% of pathogenic NF1 mutations in different laboratories [15–21, 26–28]. The NF1 mutations were detected in our study was in 92.6% (88/95) of the subjects when five patients who did not completely met the clinical diagnostic criteria were excluded. Our analysis and this study may have missed the genetic variants residing in the promotor and intronic untranscribed non-coding regions or those involved in large genomic rearrangements or epigenetic mechanisms. We anticipate that whole-genome analysis may provide further insights for the information related to this issue. NF1 is a progressive disorder complicated by the variability of disease expression. Beyond the primary concern of cutaneous/dermal neurofibromas, pigmented lesions, and the occasional limb abnormalities, the majority of NF1 patients do not fulfill the NIH criteria. Only ~ 30% of NF1 patients develop clinically detectable plexiform neurofibromas, and many features of NF1 only display café-au-lait spots and mild symptoms or no major disease complications in their early life [5, 36, 37]. Although neurofibromatosis type 1 is the most common syndrome seen in children with multiple café-au-lait spots, other syndromes associated with one or more café-au-lait spots include McCune-Albright syndrome, Legius syndrome, Noonan syndrome and other neuro-cardio-facio-cutaneous syndromes . It also shares some features including reduced growth, facial dysmorphia, cardiac defects, skeletal and ectodermal anomalies, variable cognitive deficits, and susceptibility to certain malignancies with a group of clinically distinct developmental disorders [23–25]. Neurofibromatosis type I, Noonan syndrome, LEOPARD syndrome, and cardiofaciocutaneous syndromes were usually grouped as “neuro-cardio-facio-cutaneous” (NCFC) syndromes but are now called as “RaSopathies”. All these disorders involve a common Ras–Raf–signaling pathway [39–41]. To our knowledge, germline KRAS mutations occasionally occur in Noonan (2–4%) [42–46] and CFC syndromes (< 2%) [43–45, 47, 49]. Germline BRAF mutations can cause CFC syndrome (approximately 50–75%) [44, 47–50], Noonan syndrome [47, 50], and LEOPARD syndrome type 3 (< 2%) [50, 51]. However, these individuals usually are not associated with neurofibromas (Table 4). Craniofacial anomalies, short and webbed neck, cardiac conduction defects, Multiple pigmented skin lesions and showed growth retardation, delayed puberty, and delayed bone age. Phenotypic variation could result from different expression patterns of mutated genes, as well as from different mechanisms that disturb RAS signaling through specific interactions with effector and regulatory proteins for different mutants. Variability could also result from the feedback mechanisms that can affect upstream molecules (like RAS) but not downstream molecules . Therefore, a NGS panel with high coverage of Ras–signaling components should be very useful in clinical diagnosis. However, we cannot yet explain how the concurrence of NF1 and BRAF variants contributes to NF1 in these patients. Differential diagnosis of NF1-like patients is still challenging owing to its clinical complexity. A genetic screening using a NGS panel in high coverage of Ras–signaling components combined with Multiple Ligation-Dependent Probe Amplification analysis should enable us to get the molecular control of these clinically overlapping disorders. We believe that the availability of whole-genome analysis will provide an opportunity for the genetic diagnosis of NF1 and will bring more insights for the development of NF1. We are grateful to all the participating patients and their families who made these studies possible. The authors also thank the DNA Sequencing Core Laboratory at the Chang Gung Memorial Hospital, Linko. Dr. Wu-Chou received funding by grants from the National Science Council, Taiwan (NSC94–2320-B-182A-020) and the Chang Gung Research Foundation (CMRPG 33139, CMRPG 331393, CMRPG 3D0391–3). YHWC conceived and designed the study, carried out the lab data analysis, interpreted the results and drafted the manuscript. The study subjects were assessed by the pediatric physician JLL, neurological physician THY, and plastic surgeons CHL, CCY, KTC, and YRC at the Chang Gung Craniofacial Center. YTL contributed to participant recruitment, acquisition of samples and experimental data. ZCH and HWC performed molecular genetic experiments. All authors have approved the final manuscript for submission. All procedures performed in studies involving human participants were in accordance with the ethical standards of the institutional and/or national research committee and with the 1964 Helsinki Declaration and its later amendments or comparable ethical standards. Ethics approval was obtained by the institutional review board (102-0226A3) at the Chang Gung Memorial Hospital. Informed consent was individually obtained from all participants included in the study.